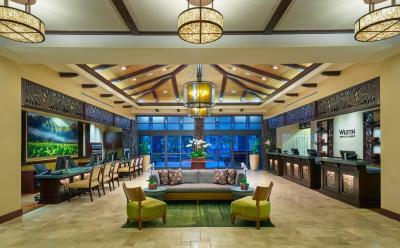 Lock in a great price for The Westin Princeville Ocean Resort Villas – rated 8.2 by recent guests! The hotel was nice and clean. Room was good size and facility great. All staff in hotel were extremely nice and helpful like we never experience before! After several hours waiting for the room to be ready after normal check in time, Alex the front desk manager finally worked us into our room. It was beautiful and had everything we were promised from the start. If you have problems at check in ask for Alex. I enjoyed the option of trading room service for a free breakfast buffet. Very spacious room with lots of light and two large screen tv’s. Roomy kitchen with basic cooking needs. Little general store seems well supplied. Staff always friendly, but not intrusive. Will hold doors, smile and greet you. Love the Ne-Ne’s! The balcony was great. Lots of pool lounge chairs to choose from great outside pool food provisions including mixed drinks. Loved the turkey wrap. For the most part, a quiet & relaxing place that is ray to get to. Great location. Close to shopping/stores and outdoor activities. Short hike to great beach. Luxury studio was perfect size for 2 people with decent kitchen. Clean pools/hot-tub. All staff went above and beyond to meet our needs. The property is lush and well equipped. The Westin Princeville Ocean Resort Villas This rating is a reflection of how the property compares to the industry standard when it comes to price, facilities and services available. It's based on a self-evaluation by the property. Use this rating to help choose your stay! 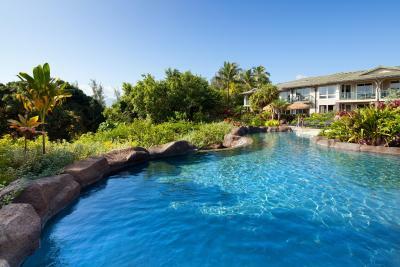 One of our top picks in Princeville.Nestled on a cliff on the north shore of the Hawaiian island of Kaua'i, this resort in Princeville offers spacious villas with all the comforts of home as well as luxurious facilities. The Westin Princeville Resort Villas features a free shuttle service to destinations within 2.5 mi of the hotel such as nearby golf courses and shopping. Guests can spend the day sipping a cocktail beside the pool or exploring the beautiful area. The villas at the Princeville Westin Resort boast full kitchens. Guests will also appreciate the flat-screen TV, whirlpool tub and the comfortable Heavenly Bed. Nanea Restaurant, located on-site, offers casual indoor and outdoor dining for breakfast, lunch and dinner. For delicious baked goods, deli sandwiches, salads and groceries, guests can stop by the resort's Princeville Market. When would you like to stay at The Westin Princeville Ocean Resort Villas? Private parking is available on site (reservation is needed) and costs USD 15.62 per day. House Rules The Westin Princeville Ocean Resort Villas takes special requests – add in the next step! The Westin Princeville Ocean Resort Villas accepts these cards and reserves the right to temporarily hold an amount prior to arrival. Only Breakfast rate plan includes buffet breakfast for two in Nanea Restaurant. Sunday Breakfast served in Princeville Market or additional $13 plus tax & gratuity per person for Sunday Brunch. This resort charges an additional parking fee per night, not included in the room rate. Charge for bottled water in the room was unnecessary and expensive! most of the resort area is noisy due to a lot of huge AC fans - this destroys the overall perfect environment; it´was not possible to sleep with open windows! The sight of hundreds of flames burning on mock torches around the grounds is disgusting. To most international visitors who are trying to reduce greenhouse gas emissions, these flames are simply producing greenhouse gases by burning gas for no benefit, other than for aesthetic reasons. Take it from me, anyone who is concerned about our environment will find this disgraceful waste of fuel abhorrent. This hotel needs to change its attitude to environmental issues immediately. Kate, the manager, was one of the rudest people I have ever dealt with in all of my travels. Because of her, I will never return to this property. Also, despite being a ‘Westin’, the property fails to offer the Westin benefits that are shown on the Westin brochure in the rooms (no asterisks or statements indicating that this property was excluded). Overall, a very disappointing experience with management and check-in. Shannon, LJ, & Brandon were super helpful! The villas are somewhat pricey. Hotel needs more parking space and bar service with later hours. The location does not make much sense; on top of a cliff. The path to the beach is a very slippery, steep trail in the rain forest. Homeless encampment on the beach (although not very visible under the trees). Nothing to do besides golf, does not feel like Hawaii. Very friendly and helpful staff, comfortable, well equipped condos.The landscaping was spectacular. No beach access (not a huge deal in Kauai as you end up driving to many different locations regardless. Great location - easy access to area beaches. Rooms have small kitchen and sitting area. not quite condo, but more functional than a standard hotel. Located on the rainy side of the Island. Service in the restaurant was slow. Large and clean room, fully equipped kitchen, perfect bed, easy parking, great pool area and fitness. Princeville AirPort is nearby. Perfect for a helicopter flight (Blue Hawaiian). very bad attitude from staff and very bad and old room with furniture. staff attitude was very very bad. We felt like we overpaid the room rate... should have been less according to our research. We booked 2 months in advance and were told if you book way ahead the rates would be less... didn’t happen.